Richard DeProspo is an investment professional with over 30 years’ experience assisting state and local governments throughout the country with the financing of complex public projects. An expert on public employee pension management, he has lectured widely on the topic and advised numerous municipalities and public pension funds on the proper management of employee retirement liabilities. Mr. DeProspo holds B. A. and M.B.A. degrees from the State University of New York and has been a licensed securities professional since 1980. Up In Smoke in his first non-fiction work. Contained within its pages lies a startling examination of our nation’s retirement systems and what can, and must, be done now to prevent a tragic outcome for the generations ahead. Every year, more and more Americans reach retirement age. Ideally, this trend should be matched by proportionate growth in retirement fund provisions. Unfortunately, this is not the case. Many Americans dream of a safe and comfortable retirement, but the cruel reality is that this dream might never be realized as retirement funds are not growing fast enough to match the ever-increasing numbers. For the private sector, the solution has been to gradually push the burden to private citizens by offering alternatives to the traditional retirement plans. The alternatives, however, fall far short of expectations. The public sector, on the other hand, is increasingly being strained by the ever-growing funding gap. In either case, the future is very bleak. Americans, for several reasons, are unable to make enough personal contributions to their retirement plans, while in the public sector the pension liabilities continue to grow, making it increasingly difficult for the authorities to honor their pension obligations. How did the situation get to this? Richard L. DeProspo has some answers for you in Up in Smoke: How the Retirement Crisis Shattered the American Dream. Up in Smoke: How the Retirement Crisis Shattered the American Dream by Richard L. DeProspo is a deeply insightful book that throws light on America's pension crisis. The book gives a true picture of the harsh reality happening across America with a detailed history of the crisis. With well- scrutinized data, Richard L. DeProspo explores the root causes of the retirement crisis. I found myself asking this question over and over as I read; how did America get it so wrong? And Richard L. DeProspo's insightful writing provided the much needed answers and some practical solutions. So if you are intrigued by this crisis, how it all went wrong and what can be done to set the trend right once again, read this shrewd examination of the situation for some much needed insight. The book is a very detailed, genuinely practical and very informative eye opener. A truly worthy read. How the Retirement Crisis Shattered the American Dream by Richard L. DeProspo is a comprehensive, all-encompassing book on the state of retirement income and funds in present day America. Richard L. DeProspo brings several years of experience and expertise into play as he discusses in detail the state of retirement income in this country and the somewhat inadequate state it is in. How the Retirement Crisis Shattered the American Dream is divided into several chapters, each one addressing an important retirement concern such as social security and what it truly means, 401(k) accounts, pension plans, and the most important, the social context and mindset of people where most people are unprepared for what retirement entails, and the lack of funds and planning that could be the downfall of many. Throughout the book, Richard L. DeProspo presents real life scenarios and examples, along with statistical data that proves to be an eye-opener. I thought How the Retirement Crisis Shattered the American Dream by Richard L. DeProspo was a very thoroughly researched book and clearly shows Richard’s expertise in the field. The book contains a lot of useful and pertinent information that many people may not be aware of. It also contains detailed analyses of the various government pension funds, as well as employer sponsored retirement income plans that I found extremely helpful. The writing style is clear, concise, and engaging, and makes this not only a practical and useful book, but also an enjoyable one. This is an excellent book and one I would highly recommend. 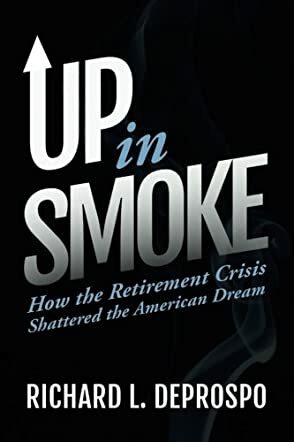 Up in Smoke: How the Retirement Crisis Shattered the American Dream by Richard L. DeProspo shows us the serious problem we are facing with those who are retiring now. The U.S. Census Bureau estimates there are currently forty million Americans aged sixty-five and over. As of 2011, the baby boomers are reaching the age of retirement and nearly 10,000 new retirees come into the system every day, and this is supposed to keep happening for the next 15 years. By 2030, it is expected that 18% of the total American population will be retired. What does that mean for the retirement system currently in place? It means bigger problems than there already are with the underfunded programs. Author Richard L. DeProspo has written a very clear, in-depth book that makes everything understandable. Like most Americans, I knew some basics about how bad our system was for those who are going to retire, but I didn't know it was this bad. Everyone needs to read this book so that they can truly understand how much trouble we are in as a country. It can be hard to read financial reports and understand how all of it is put together and works, but Richard L. DeProspo has really expressed everything in plain language that makes it easy for readers to understand. I recommend this book because, as a populace, we need to understand what is going on in our government. Some day, every one of us is going to retire and we need to know what we are in for.